Brett Kavanaugh, the Supreme Court nominee repeatedly accused of sexual misconduct, is currently blubbering before the Senate Judiciary Committee in an attempt to paint himself as a victim, a champion of women, and a family man. Naturally, some viewers noticed that, curiously, Kavanaugh’s left hand is absent of a wedding band. There’s a certain juiciness to the missing ring—that perhaps the past two weeks of allegations have put a strain on Kavanaugh’s marriage. “Does Kavanaugh not wear a wedding ring?” Washington Post reporter Angela Fritz asked Twitter, echoing a now-deleted tweet from a Random House Social Media Manager, and dozens of other Twitter users. It makes a compelling narrative, but the underlying hypothesis is inaccurate. This is not to say Kavanaugh is wearing a ring that, I don’t know, happens to be transparent. It’s just that he hasn’t worn one in a while, at least not while being photographed in public. Here’s Brett with Mississippi Senator Cindy Hyde-Smith taken in late July. No ring. And here’s a ringless Brett on July 11, shaking hands with Senator Orin Hatch. Look closely and you can see Mrs. Ashley Kavanaugh is wearing a wedding ring at her husband’s nomination press conference. Brett? Not so much. 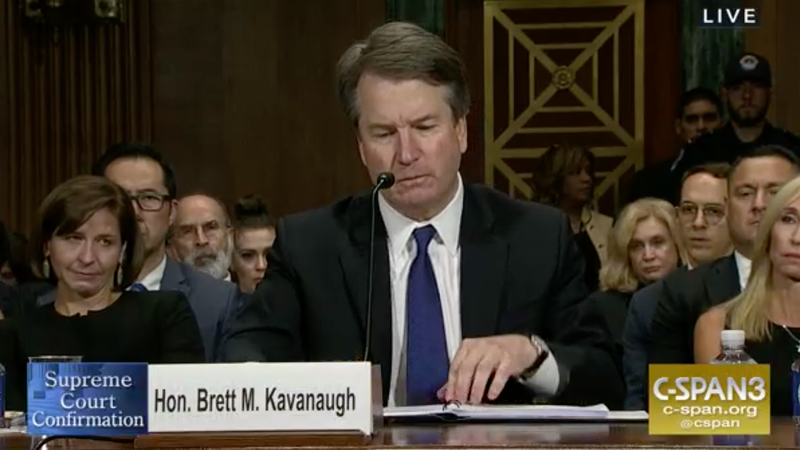 And here, just a few weeks ago, on the third day of his initial confirmation hearing, Brett is sporting a pretty bland watch and exactly zero rings! Sadly, there are no photos available on Getty, the Associated Press, or the Reuters photo wire of Judge Kavanaugh between his time with the Bush White House and the current proceedings—although a few available photos from 2006 reveal that Brett did wear the piece of matrimonial jewelry in question some years ago. Huh! Far be it from us to speculate on why he may have removed his ring—although we’ve reached out to his office for comment, should Judge Kavanaugh be willing to share that information. Suffice to say, Kavanaugh’s nomination to the Supreme Court may be in deep trouble after the courageous and heartfelt testimony of Dr. Christine Blasey Ford, but there’s no current evidence his marriage is similarly embattled.